I know that I am a little late posting this but I ended up getting sick at the end of the month and it took me a little while to get back in fighting shape. However, it did make me happy that we did so well on our grocery budget last month. 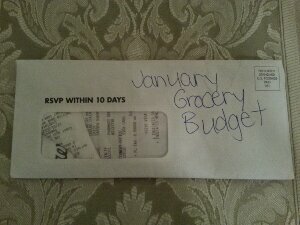 I don’t usually post about our grocery budget but I’m going to try to do a monthly review every month this year in 2013. People I know who don’t coupon think that this is an extremely low number. People who do coupon tend to think that this is a high number. I like to think that it is in the middle. – We try to eat healthy with as little junk food as possible- This means more fresh vegetables and fruits that aren’t that cheap in where we live. Also healthy foods have fewer coupons than junk food. – We really do eat at home all the time- This means our grocery budget is a little higher but our eating out budget is a lot lower. – This budget isn’t just food- It’s also all household items we may need like soap. – Shopping at Aldi a Discount Grocery Store- Food staples are simply lower at Aldi. Although Aldi doesn’t take coupons, most of the items we buy there aren’t items that usually have coupons anyways like flour and sugar. – Use it Up, Wear it Out, Make it Do or Do Without- We try not to waste food and we also try to make our meals around the items that we get deals. So how did we do this month? So we actually came in under budget which is always good. Also, $20 of what we spent was on the last day of January on groceries that we were generally buying for next month, but as I said I was sick and didn’t think I would make it back to the store for a while and I didn’t. Tune in at the end of Febuary to see how we do with our $200 grocery budget for next month.